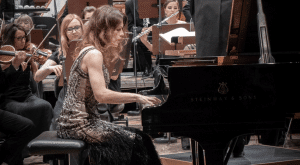 What is a piano recital dress code? It might seem like a tricky question at first with a dizzying array of considerations: “Are my clothes too casual or are they unfashionable?” “What is the piano recital dress code of the venue and what are the expectations of the audience?” However, by reading the following tips you will find that the conundrum of what to wear to a recital as a performer is not so daunting. Venues may have specific requirements or preferences for their piano recital dress code and it is a good idea to confirm what these are with the event coordinators. At the same time, a universal convention is to wear formal clothes. A piano recital dress code is not an arbitrary set of rules that one may consider an intrusion upon their stylistic choices; in fact, there are very strong rationales behind it. A piano recital dress code constitutes a visual representation of the elegance, refinement, and intellectual beauty of classical music. Dressing up for the performance also pays respect to the composers of timeless musical pieces. In terms of what to wear for a piano recital dress code, formal slacks are acceptable for both genders although, for women, short skirts above the knee are generally not appropriate. One should avoid stilettos, open toe heels, flip flops, and platform shoes. Moreover, these footwear choices will impede your control of the pedals. By the same token if you intend to wear new shoes, try them on before the recital to ensure that they fit and to avoid having them slide on the pedals if they are too large. Regarding piano recital dress code for female performers, a formal blouse or button down are safe choices while plunging necklines, low cut backs, and spaghetti straps are unsuitable. For male performers, a button dress shirt, tie or bow tie, black waistcoat, jacket, and cummerbund are acceptable options for a piano recital dress code. If you are wearing a jacket to a recital, establish that it allows for full mobility while not being too baggy. Similarly, it is a good idea to remove jewelry such as watches, bracelets wrist corsages, or rings that can obstruct playing and clang on the keys. Remember that your clothing should be tasteful rather than distracting or glitzy while also being practical and functional. Potential pitfalls in your performance will be easily avoided if you wear the right clothes that follow the piano recital dress code and which allow for flexibility. Another thing to take into account in terms of what to wear is the temperature of the venue. For example, during my last recital I was playing in sweltering summer heat and the room temperature was variously redolent of a sauna or packed train. However, I was able to remove my jacket, which helped immensely. It is therefore important to confirm what a venue’s piano recital dress code allows for in relation to contingencies such as weather conditions, ventilation, and hot stage lights. Whether you have long or short hair it is advisable to have it groomed. As a performer with occasionally long hair, I ensure that it is set rather than unkempt to avoid it getting in my eyes or worse still, in my mouth or nose, as I play. Maintaining the right hairstyle is also important as the audience will want to see your face and if it is hidden behind a curtain of hair, this will affect your presentation and their appreciation of your recital. Above all else make certain that you are comfortable in your clothes. Given the pressure of a looming recital, your mind may amplify clothing issues such as the tightness of a shirt or blouse around the collar, shoulders or elbows. A useful tip is to practice in your recital attire and become accustomed to it the day before the performance. This way you can iron out any unforeseen wardrobe issues, particularly when it comes to cumbersome jewelry, overhanging cuffs, and sliding shoes. Additionally, it might be a good idea to invest in a tailor who will make custom fit garments. By following your specifications, a tailor will produce clothes that address potential problems such as constriction around the upper back area and arms, which can be an issue when it comes to jackets or shirts. When considering what to wear it is possible to experiment with different formal clothing options to create your own unique style. After all, it is fun to dress up for the occasion. However, it is necessary to confirm that one’s fashion choices fall within the norms of the venue’s piano recital dress code. Ultimately you want your clothes to become a second skin so that you can focus exclusively on your performance.